Last day I received some critical tasks on production to increase Virtual Machine Hard disk VMDK size, on around 200 vms. For 99.99% I have my own VMWare PowerCLI scripts repository to automate my tasks to complete it before time. While running script I was getting errors, To further troubleshoot I tried to increase the disk size using vSphere web client, --> Virtual Machine Edit Settings. Expanding vmdk that is larger than 2Tb was still failing and getting same error as below. Hot-extend was invoked with size (8323596288 sectors) >= 2TB. Hot-extend beyond or equal to 2TB is not supported. Same error can be seen on VM tasks and events as in error stack. There is a great KB article no 2058287 in VMware docs, which is very helpful to resolve the issue. But what I found is (When virtual machine is powered on) Hot extending virtual disk bigger than 2 TB is not supported on ESXi hosts 6.0 and 5.5, You must be using ESXi 6.5. Get downtime on VM, shut it down and extend it as per requirement. For large capacity virtual disks, An ESXi 5.5 or later host version is required. You can clone or storage vMotion/migrate (SvMotion) greater than 2 TB to only ESXi 5.5.x and 6.x host. Virtual Machine vmdk disks must be on VMFS-5 Datastores, The maximum supported VMDK size on VMFS-5 datastore can be increased to 62 TB, However the maximum supported VMDK size on VMFS-3 is still 2 TB. If VMFS disk are on NFS drive, the maximum supported size is the little smaller than 62 TB and 1% less than the maximum file size supported by the NFS file system. To support larger virtual hard disks than 2 TB, VM guest operating system must support it and for using larger disk make sure you use GUID partition table (GPT) partitioning scheme, while initializing and formatting disks. If virtual machine has configured in FT (Fault Tolerance), disk expansion is not supported. vSAN 5.5 is not supported but vSAN 6.x supports 62 TB. Virtual Machine with BusLogic parallel drive controllers are not supported. 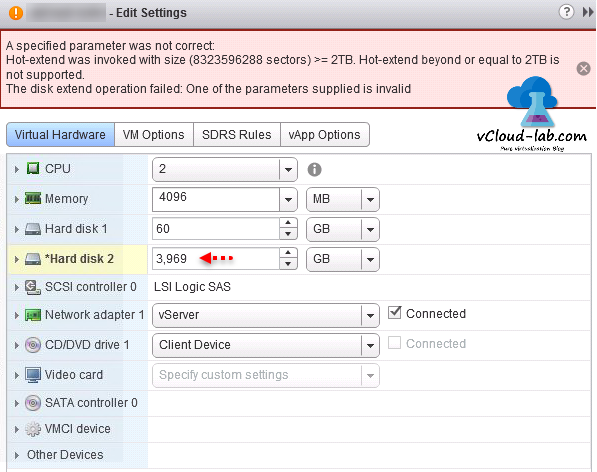 You cannot relocate RDMs larger than 2 TB to datastores other than VMFS-5 or, to hosts older than ESXi 5.5. Make sure you have adequate space on datastore. And for further more troubleshooting you can use vmkfstools to troubleshoot.